On Monday 27th February, Josh and Cameron, two second year retail students, visited L’Oréal head office in London for an insight day where they had the opportunity to speak to some of the interns taking part in their business placement scheme. The pair were invited along to the ‘bring a friend to work’ style event by Katie, another retail student who is currently taking part in a Visual Merchandising placement within L’Oréal’s luxury Lancôme brand. Her job is to design and implement VM briefs at Lancôme’s many concessions, and regularly visits those in Selfridges and Harrods, as well as other beauty retailers and department stores in central London. 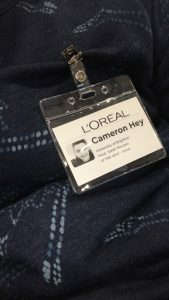 Prior to the day, Sarah McCann, L’Oréal’s Graduate Talent Co-Ordinator, had arranged for Cameron and Josh to be paired up with interns within the business who were on placements in their areas of interest. 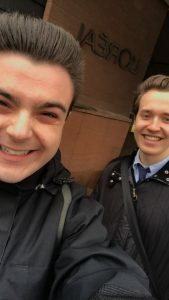 Cameron chose to look at the commercial internship placement strand, and so was placed with Tom, a Leeds University student whose role is to be the first point of contact for L’Oréal brands within Sainsbury’s and ASDA stores. His job is to design merchandising briefs, organise the printing and distribution of price tags and display stands, as well as be in constant contact with the supermarket brands sorting out issues such as pricing and over- or under-performing products. Josh was lucky enough to be paired with two different intern students. The first was Joanna, she was part of the e-retail team producing reports detailing ways in which retailers could improve their online strategies to increase sales and brand awareness. This enabled Josh to get a detailed understanding of what it is like to work within a market leader’s e- retail department. In addition Josh shadowed another intern called Jack on the commercial placement pathway working within the business intelligence department within L’Oreal professional. His role consisted of consulting with other departments on how they could increase sales as well as producing reports outlining how successful each of the salons stocking L’Oreal products were. Overall it was a fantastic day and a great learning experience! This entry was posted in Retail by Kerry Burnett. Bookmark the permalink.